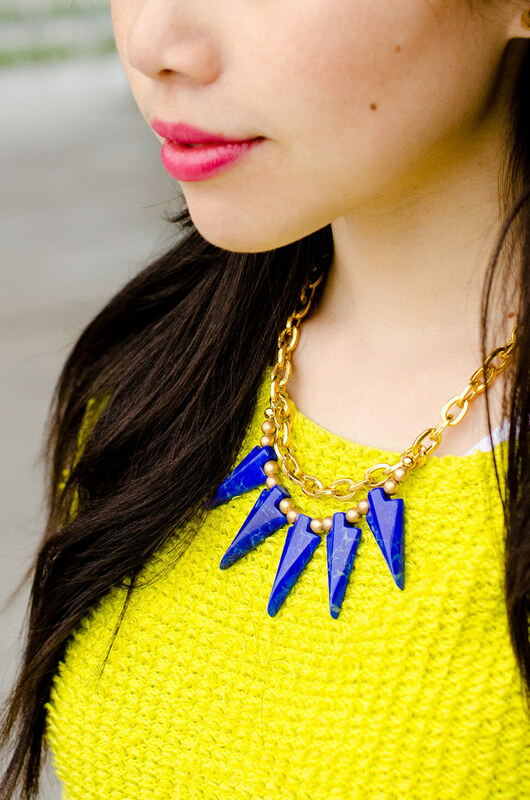 Love your lip color & all of the brights! yes! love the colour combo, so good! That necklace is amazing too! yay! i love the color combo!! just blogged about the SAME colors 🙂 Glad to know I’m not the only one thinking in terms of bright and bold neons, lol! you look beautiful as always! Love it! The pop of blue is totally unexpected yet super fabulous! I’m huge fan of your amazing style ever since I stumbled upon your blog a while back (esp since I love reading Vancouver bloggers who understand our up-and-down weather)! Since I adore bright colours myself, I always look forward to seeing how you style bold and bright pieces and patterns- this particular post definitely applies! The combination of the necklace and sweater is perfection. I love the hem of your neon sweater! I love this! I love your sweater with the blue! So adorable! This whole outfit is pretty fabulous, but what i love most is that amazing necklace!